Nevertheless, MP Edmon Marukyan, the leader of the recently established Bright Armenia party, believes the government can very quickly regain that trust through a few but real changes. To the level of mistrust towards the authorities speak protests organized by various social groups in front of the central government offices virtually on a weekly basis. Thus, farmers from several villages of Armenia’s Ararat and Vayots Dzor have been protesting against a situation in which despite a pledge from a private processing company backed with government guarantees they have not yet been paid for the grapes they sold last fall. Earlier, Prime Minister Hovik Abrahamyan had pledged that the problem would be resolved before May 10. Ten days after the promised deadline, the farmers say they still have not received any payment. 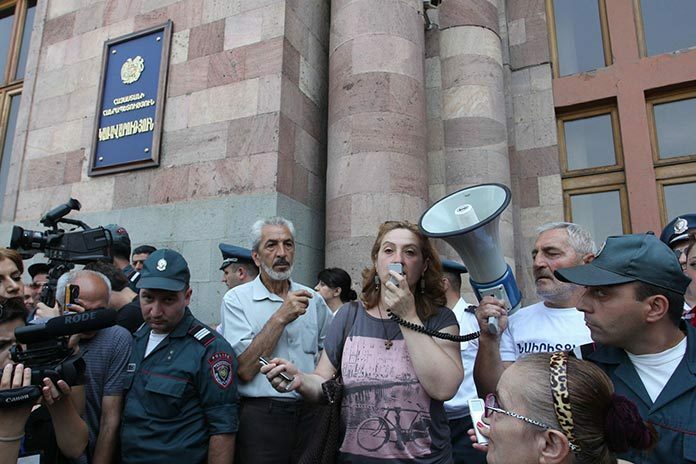 Complaints about the indifference of the authorities these days have also been made by residents of Garni, a village located some 20 kilometers to the east of capital Yerevan. Villagers have been fighting against a pipeline construction that would re-channel some of the area’s water to the Ararat plain for irrigation purposes. Specialists say the need for Garni water has emerged because of mismanagement of artesian water in the valley that has been dotted with fisheries mostly belonging to extended families of senior officials that admittedly consume a lot of water, making local groundwater wells go dry. Seeing no other legal way to get their rights protected, people are often forced to exercise their last right to protest that sometimes takes the form of blocking roads and even not letting children attend schools, like some families in the village of Kaghtsrashen did earlier this week in a “grapes pay protest”. Government critic Marukyan still believes that this situation can be quickly addressed and changed. “There is no trust, but it can quickly be regained. If the government takes quick steps to deal with corruption, it will be restored very quickly, because it is determined by actions, not rhetoric,” the opposition lawmaker told ArmeniaNow, referring to Prime Minister Hovik Abrahamyan’s statements about the start of a fight against corruption made in recent days. To Marukyan, however, it is clear that the latest actions of the government, including its cost-cutting measures and administrative staff “optimization” have to do with the approaching elections. “But even in this case, this is a positive development, because, as they say, better late than never,” he said. On Thursday, the government announced that it will reduce the car fleet of administrative bodies by some 800, which will help decrease operational and maintenance costs. However, the opposition lawmaker considers this as more of a “cosmetic” change that will hardly regain any popular trust for the ruling Republican Party of Armenia (RPA). “In elections, they rely on local ‘tough guys’ for the sake of whom people will vote for the party not necessarily trusting it,” Marukyan concluded. RPA representatives have repeatedly shrugged off similar criticism from the opposition, calling themselves the most popular and credible force in Armenia that is going to dominate the local political landscape for at least another decade and possibly beyond. Armenia’s next parliamentary elections are due in April or May 2017.